The E-Z Scan AB5500+ offers a portable, digital, combination A-scan and B-scan, with easy-to-use touch screen operation, high resolution, extreme accuracy, repeatable measurements and trusted Sonomed Escalon reliability. The E-Z Scan A-Scan offers built-in immersion capabilities and up to eight IOL formulas, including two post-refractive formulas. Axial length, ACD, and lens thickness are provided for each scan. Group up to five scans with average axial length and standard deviation automatically calculated. Easily review each scan, delete outlying scans, and add new scans, as desired. Customizable tissue velocities of each structure and highly-developed automatic scan recognition algorithms ensure accurate and repeatable measures. Built-in calibration check ensures continued accuracy of system. The E-Z Scan B-Scan provides excellent resolution with a full set of features including display of A-scan trace across a selectable vector, zoom and pan capabilities, multiple color and grayscale display modes, measurement functions, annotation, and more. The real-time B-scan display, adjustable gain and TVG controls, and enhanced "high-resolution" mode which produces a scan with 256 line vectors facilitate optimal diagnostic viewing. The E-Z Scan 5500+ series offers extreme portability, weighing about 5 lbs (2.4 kg), and comes with an optional padded carrying case. A video printer comes standard and allows for printing of a hardcopy record of scans and data. A data download and scan viewer software option is also available to create permanent digital archive of scan results. Two A-Scan probe styles are available - standard or soft-touch - depending upon user preference and scanning application. Built-in immersion scanning capabilities is provided with optional Prager shell for ease of use and the highest assurance of accuracy and repeatability. 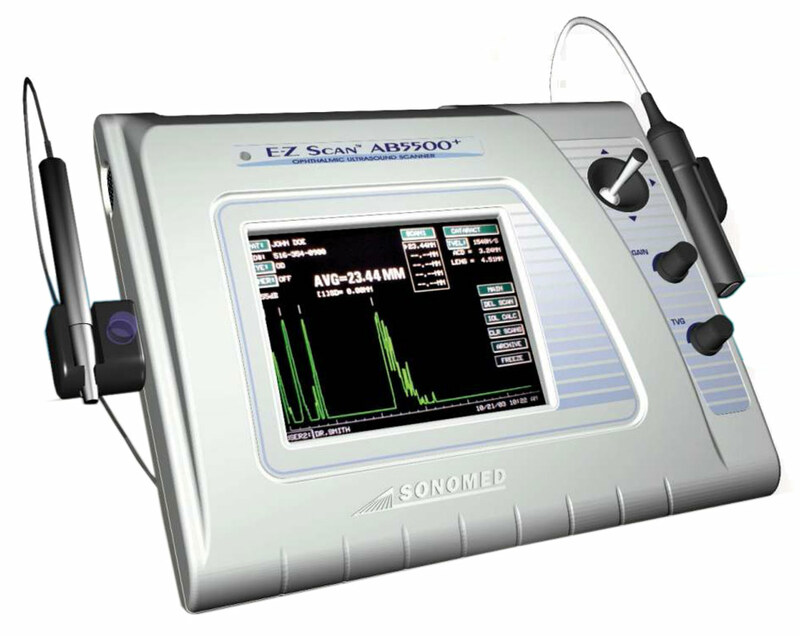 Are you done with the A/B Scan Sonomed EZ AB5500+? Go to A-Scan page.